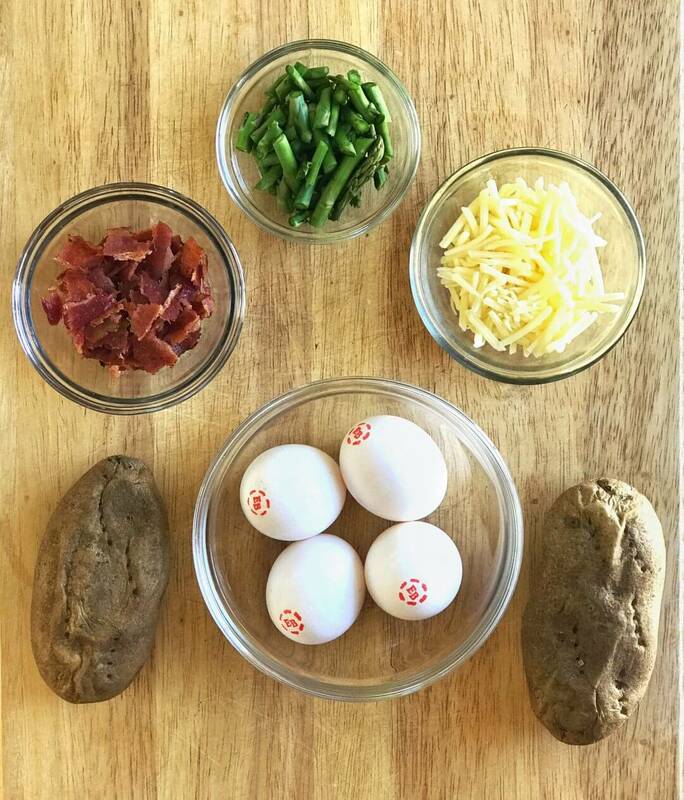 Load potato halves with veggies, bacon, cheese and an egg to make simple potato pockets for a fun, easy and versatile dish perfect for any time of day. If you hit any deli or meat-and-three restaurant in the south, the odds that there is a HUGE “baked potato” side dish overstuffed with sour cream, butter, cheese and bacon is pretty great. And while a loaded potato every once in awhile isn’t a bad thing at all (I love potatoes for their potassium and fiber!) there are definitely some simple swaps to give then tons of flavor and zest to make them just a little bit better for you. That’s why I adore these Bacon, Veggie and Egg Potato Pockets because they’re bursting with melted cheese, tender asparagus, crispy bacon and oozing with a runny egg. 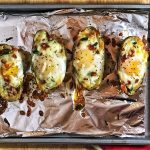 These stuffed potato halves certainly turn an ordinary side dish into an extraordinary breakfast, lunch or “brinner” in no time! And here’s a little secret about them, they can be made ahead and reheated! When I made the batch in the photos, Brent and I both ate one for dinner leaving two more eggs. I put them in an airtight container in the fridge and then heated them up in the microwave for about 30 seconds the next morning for breakfast. Even better was that the potato and filling got hot but the yolk stayed runny—big win for me! Now don’t worry, if you like eggs but prefer a more firm yolk, add 3-5 minutes to the bake time and you’ll be all set! 1. 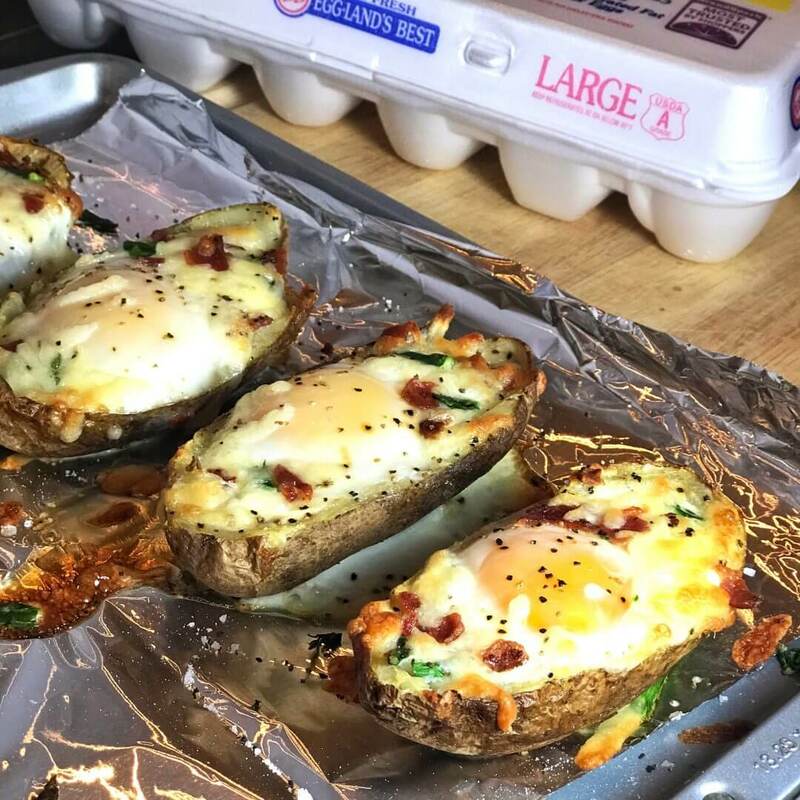 The recipe is a great use for leftover baked potatoes! Or, cook them in the microwave for 10 minutes. Start by making baked potatoes. Next time you make them as a dinner side, bake a few extra so they’ll be ready the next morning to make these potato pockets or pop some small ones in the microwave for 10 minutes and they’ll be ready in no time. Be sure to poke a few holes in them with a fork so they don’t explode! 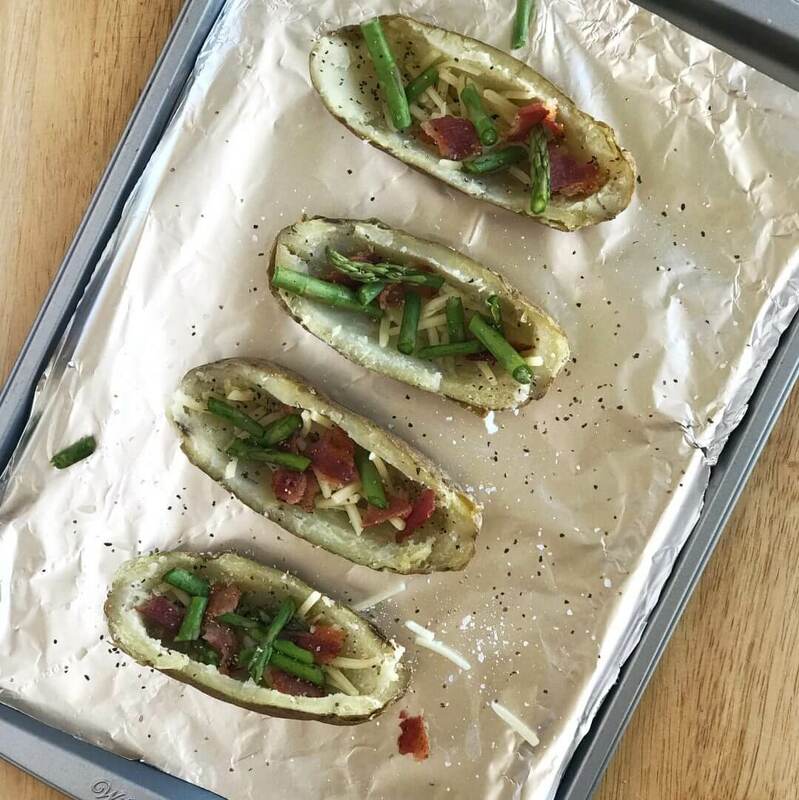 Scoop pulp out of a baked potato half and stuff with cheese, asparagus and bacon. Once the potatoes have baked, allow them to cool slightly then scoop out the potato pulp leaving a 1/4-inch border of potato. Use the extra potato for mashed potatoes or Creamy Potato Soup. Note that this part is when it gets a little tricky because if you overload your potato with too many ingredients, the egg will fall out. Add a small amount of shredded cheese, some chopped asparagus, crumbled bacon, salt and pepper to each potato half. Add one egg to each potato half. Gently crack an egg into the center of each potato half being careful not to pierce the yolk. The first time I did this the entire egg slipped right out on the the baking sheet and then became a mess when I tried to spoon it back in so take your time and make sure there is enough room for the egg inside the potato. Note that if your potatoes are small, you may consider using medium-sized eggs. 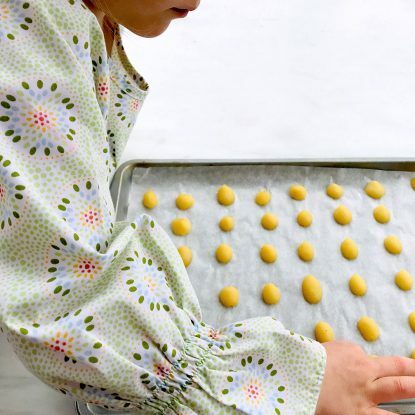 Bake until whites are set and yolks are soft. Bake the potatoes until the whites are firm and the yolks are tender. Depending on your oven, this should take around 18-20 minutes. If you aren’t sure, take them out and give them the jiggle test. If the whites are still translucent or jiggle, put them back in for another minute or two. SCROLL DOWN FOR THE RECIPE!! Wash, dry and poke holes in potatoes with a fork. Microwave on HIGH for 10 minutes or until cooked, turning half way through. Remove from microwave, slice in half, and allow to slightly cool. Scoop out insides of each potato half leaving a 1/4-inch border. Sprinkle each half with 1/2 tablespoon cheese and a pinch of salt and pepper. 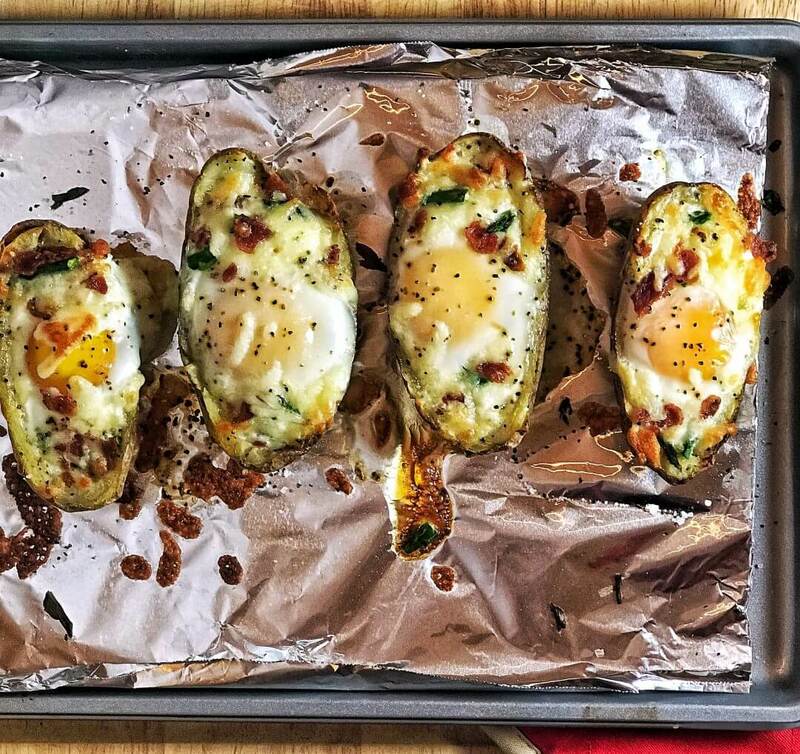 Transfer potato skins onto a foil-lined baking sheet. 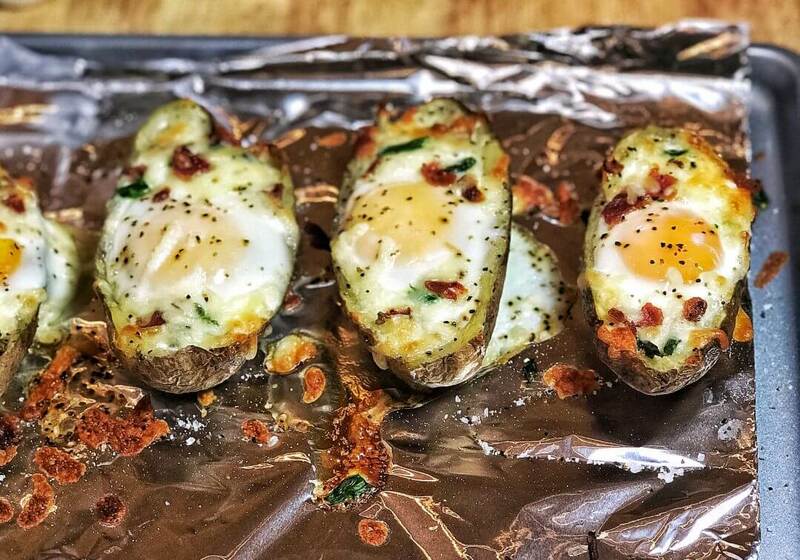 Crack one egg into each potato half. Sprinkle evenly with chopped bacon, asparagus and remaining cheese. Bake at 350F for 18-20 minutes or until whites are set and yolks are soft. Remove from the oven and allow to cool for 5 minutes. 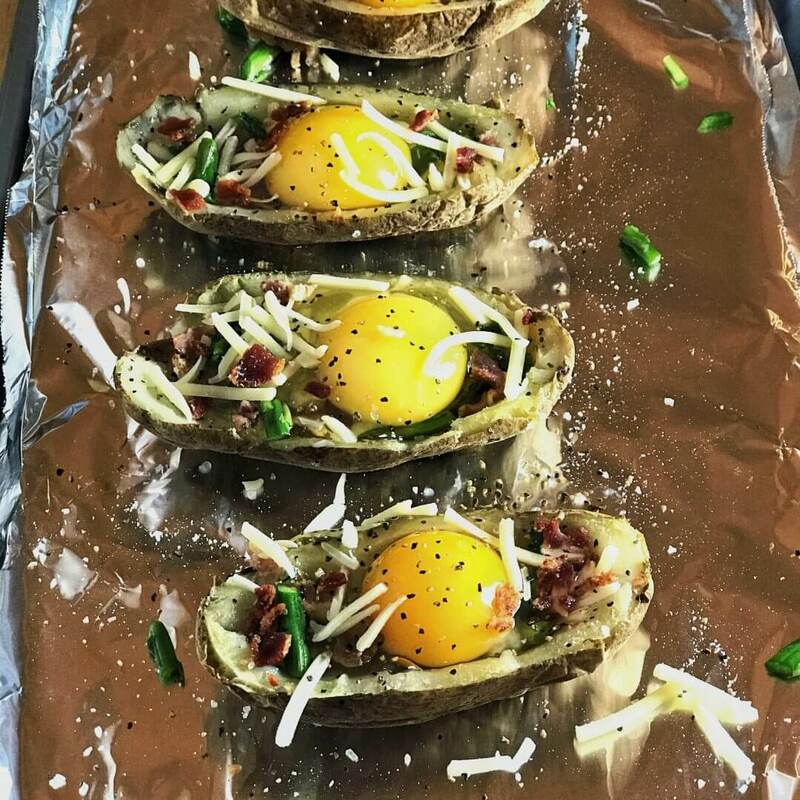 Load halved baked potatoes with veggies, bacon, an egg and cheese to make simple, savory potato pockets that are ideal for breakfast, lunch or "brinner." 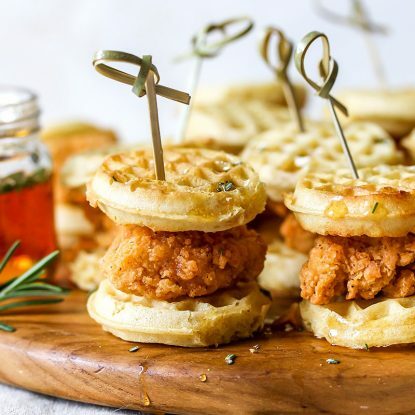 this is such a great idea for a quick dinner or even brunch. Love the Old vs New chart to really see the transformation! 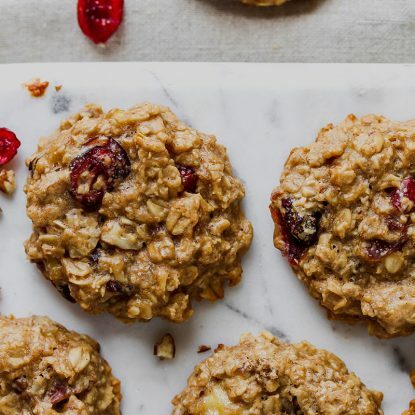 I love what you did with this recipe! !